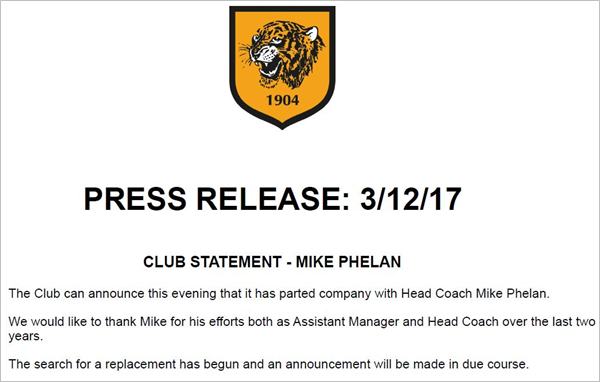 Hull City have sacked manager Mike Phelan after less than three months as permanent boss of the Tigers. The club slipped back to bottom of the Premier League on Tuesday evening, after Swansea City beat Crystal Palace 2-1, with Phelan getting the elbow the same night. The 54-year-old Phelan took over as caretaker boss at the KCOM Stadium following Steve Bruce’s departure in the summer and eventually got the job on a permanent basis in October. However, despite a good start to the new Premier League campaign which even saw the Tigers top the table after the first game (and Phelan himself bag the Manager of the Month gong). Hull have plummeted into the drop-zone. With only three points won from Hull’s last nine games, the writing was on the wall for the former Manchester United midfielder, who becomes the latest top-flight boss to lose his job this season. Hull’s owners now face the tricky task of finding the right manager to kickstart their ailing campaign, with ex-Birmingham boss Gary Rowett strongly linked with the job. However, whoever comes in will surely need more backing in the transfer market than Phelan was given if the club are to avoid dropping back down a division just a year after promotion. He likes to talk, this Mike Phelan. But can’t do his job. Talked about Moyes, talked about van Gaal, Mourinho… meanwhile he is getting sacked by Norwich, Hull and probably another small club in next few months.